Including our favorite personalized promotional ceramic drinkware. Coffee is easily one of the most popular drinks throughout the world. Indeed, 64% of Americans have at least one cup of coffee every day. But, in order to have coffee, we also need to have something to drink it from. The most common option, of course, is a coffee mug. There is a lot of valuable real estate on a mug that would probably be better suited having your company’s logo on it. Custom coffee mugs are a delightful way to provide prospective customers with a useful gift that will always remind them positively of your business. The statistics in this regard support that assertion. A 2016 Advertising Specialty Institute survey showed that consumers were 2.5 times more likely to think positively of promotional items as compared to online or mobile advertising. There’s no better way to induce positive opinions than to slap your logo design on the very container that gives your clients coffee every morning. It just makes good business sense. 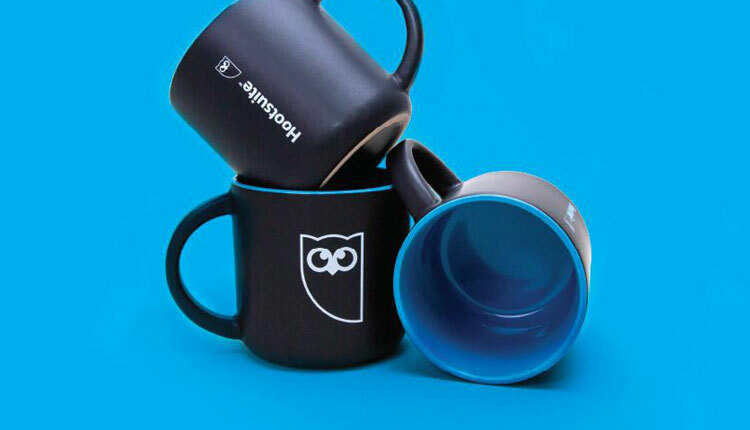 By that same token, promotional coffee mugs are extremely useful and can be taken to a number of environments, including home, work, or school. This helps improve brand awareness and recognition for years to come. Custom coffee cups also have a cavalcade of other benefits which we will discuss further. Coffee mugs are designed perfectly for drinking hot beverages. This may seem like the most obvious statement of the century, but we rarely think about how the design of the coffee mug has endured for so long. It’s just a nice cup with a handle that allows you to hold an otherwise un-hold-able drink. No one objects to receiving a coffee mug as a gift. Even in non-promotional, non-business settings, a coffee mug is a great way to show someone that you care because everyone needs a coffee mug. Of course, the fact that everyone needs one means that promotional coffee mugs are bound to provide ample advertising. It’s almost an inevitability that you have a promotional coffee mug in your home right now. In fact, check your kitchen cabinets and count how many coffee mugs have branded material on them. We’re guessing there is probably a lot. Now, think about your relationship with those brands. Do you have a favorable opinion of them? It’s statistically probable. Do you recognize the brand name and what they sell? Also, statistically probable. The fact is that everyone needs a coffee cup, and, while they don’t necessarily need a custom coffee cup, it doesn’t hurt. It also may help your business gain favorability and brand recognition in the long run. In addition to your kitchen cabinet, it’s also probable that most break rooms at work have a solid collection of disparate coffee mugs. Whether that’s because people brought them from home or because there’s a permanent assemblage of cups at the office, people are still seeing those brands on a daily basis. Thus, it makes sense for your company to become a part of that trusty assemblage of coffee cups in break rooms. Of course, custom coffee mugs can also be seen elsewhere. Teachers and professors often bring their cups to school and sip them in class. Mugs can be found in the kitchen cabinets at a church or even on job sites. There is truly no shortage of places where one might encounter a branded coffee mug with your company’s name and logo on it. Again, the ubiquity of coffee mugs means that you are bound to accrue a great deal of impressions over the cup’s lifetime. This is probably an exaggeration, but coffee mugs really do last forever. Barring an unfortunate fall from the high shelf in the cabinet, most personalized coffee mugs will remain in homes, break rooms, churches, on jobsites, and on teachers’ desks for decades to come. It is, again, very probable that you have owned a coffee mug for decades without even realizing it. The mug also probably shows very little damage and continues to serve its purpose admirably. This really drives home the point that coffee mugs are both an excellent gift and a great way to increase brand recognition. People also love familiarity. Being able to see the same coffee mug day after day will put a smile on their face. If your logo is on that cup, it will naturally bring a smile to their face, as well. Coffee cups also allow you to let your creativity flourish. Although mugs are generally fairly small, there’s plenty of room to get your point across and create a truly flashy design. Many companies will simply opt to place their logo on the side of the coffee mug and call it a day. You can go any number of routes with this. You may even want to test out your graphic design skills (or hire someone who already has those skills). Obviously, you want something that is both eye-catching and memorable. In most cases, a logo will do just fine, but the surface area of a coffee mug, while not overly abundant, still allows you to tap into your creative side. In addition to holding coffee, coffee mugs are also adept at holding virtually any other beverage. Water, milk, tea, orange juice: you name it, a coffee mug can handle it. While this is, again, exceedingly obvious, it highlights the fact that coffee drinkers aren’t the only ones who can benefit from branded coffee mugs. If you’re feeling really adventurous, you can even eat soup out of a mug. A promotional coffee mug can truly be the gift that keeps on giving (within reason). It’s also convenient for you if you actually have multiple small gifts available to give. This is typically a gift you would find at a trade show or conference. Mugs are also often found on desks as containers for a variety of office accessories like pens, pencils, paper clips, and others. Regardless of how the cup is being used, your company is still getting free advertising because of it. These cups are also usually stationary, meaning that your free promotion remains in place for months or even years. Standard coffee mugs – These generally hold around 11 ounces of liquid with a typical coffee cup shape. Some mugs have more contoured designs while others offer full color or other unique aesthetic styles. Diner mugs – These are very similar to the standard coffee cup except that there is a slight parabolic shape to them. The cups come in either 10-ounce or 14-ounce sizes. Glass mugs – As you can imagine, these mugs are see-through except for the portion where your logo or other design would go. Most glass mugs at iPromo aren’t specifically designed for coffee and are instead more suited to beer. A couple of options, however, are coffee-centric. Latte mugs – Most latte mugs are slimmer and taller than standard coffee mugs and can generally hold up to 16 ounces of liquid. Their handles are also slightly more pronounced because you need that extra air of elegance when drinking a latte. Latte mugs may also be more appropriate for holding other promotional products because of their larger size. Any of these different types of mugs would be an ideal gift for employees or customers. They will also all inevitably make their way to homes, offices, and other worksites. If this article has taught you anything, it should be that people love coffee mugs. No one has ever denied a gift of a coffee mug, and, as such, they make perfect promotional souvenirs. The best test of whether you will get any brand impressions from a promotional product is the usefulness of that product. As we’ve demonstrated, coffee cups are both useful and used a lot. Custom coffee mugs are bound to improve the general perception of your company while also increasing brand recognition. If you are considering giving away promotional coffee mugs, then you have come to the right place. We will work with you to ensure that you get the right mug with the right custom design to reach your intended audience. Of course, because we know that mugs are used by everyone, it must stand to reason that everyone is your intended audience. It must also stand to reason that everyone will eventually see your cup at some point in the near future. You certainly can’t beat that return on investment.